Hi guys, my first comparison post! I noticed I had a couple of pretty similar greyish blue pastels in my stash. 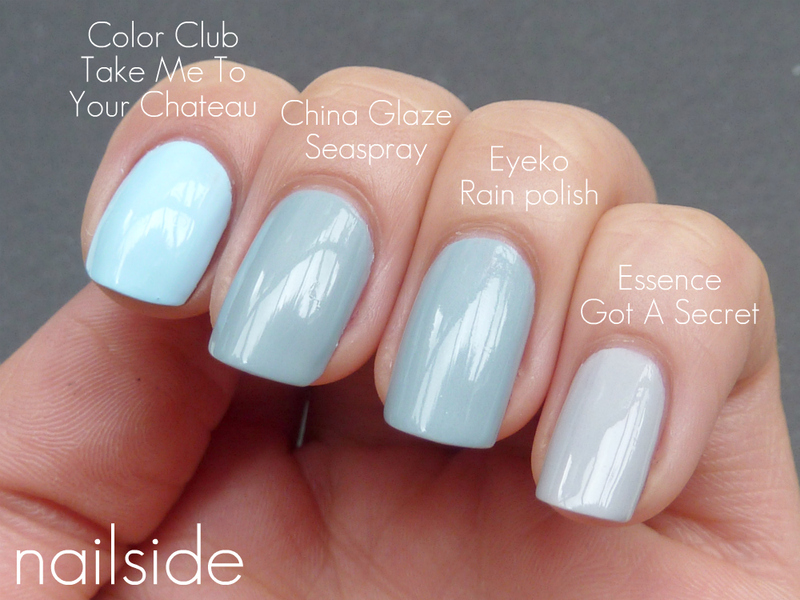 To be exactly: China Glaze Seaspray, Eyeko Rain Polish and Essence Got A Secret. I just showed Take Me To Your Cheateau next to the three 'cause I didn't want a naked nail on the picture lol. Anyway, I applied two coats of each polish. The Essence (and Color Club) had the best formula, followed by Sea Spray. Sea Spray applies pretty okay with the first coat, but it tends to get a bit streaky with the second one, still manageable though. And Rain Polish was quite a disappointement. When I bought this polish about a year ago, the greyish blue color it has wasn't very common, so I was very excited about it. But the streaky formula was such a blow that I've never used it more than one time to swatch! And one year later I ordered Sea Spray, 'cause it was "so unique" and "I didn't have anything like it yet"... Boy, was I wrong. They both have that same, very subtle, silver shimmer. And I think Rain Polish is a tiny bit lighter and more blue, but I'm talking about the tiniest bit ever here. So not a soul would notice if you'd wear both on the same hand. And then there's Essence Got A Secret, which is more an obvious grey and lighter than the last mentioned two. Also it doesn't have that blue quality but still it's a beautiful color. i think i need the china glaze one!! Awesome comparison, thank you for this one! I totally thought I need Eyeko Rain Polish, but I see Sea Spray is basically the same, one more off the WL, yay! very useful comparison, thanks for posting it! essence one is the most particular one. I love your blog! Do you have a Twitter?